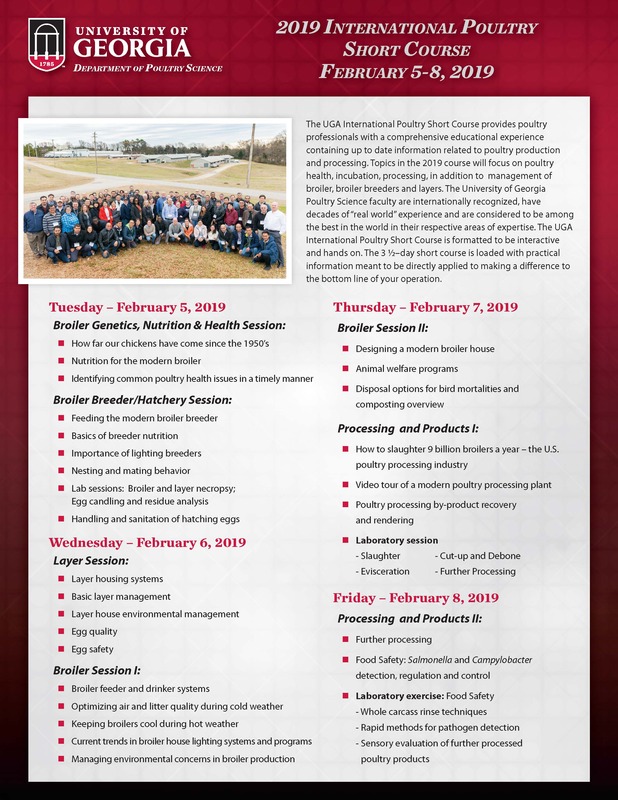 The UGA International Poultry Short Course provides poultry professionals with a comprehensive educational experience containing up to date information related to poultry production and processing. Topics in the 2019 course will focus on poultry health, incubation, processing, in addition to management of broiler, broiler breeders and layers. The University of Georgia Poultry Science faculty are internationally recognized, have decades of “real world” experience and are considered to be among the best in the world in their respective areas of expertise. The UGA International Poultry Short Course is formatted to be interactive and hands on. The 3 ½–day short course is loaded with practical information meant to be directly applied to making a difference to the bottom line of your operation.